Yeah, you heard right! Free fabric! For all of you crafty folk out there I thought I'd share a giveaway that I stumbled upon. Isn't that soooo nice of me?! 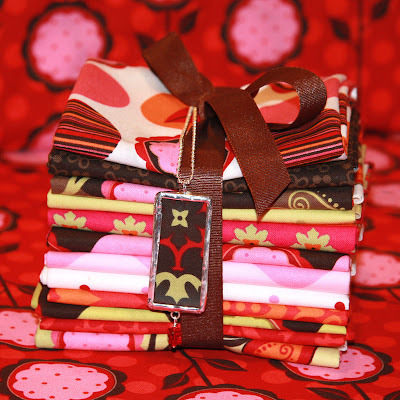 Jane of LanieJane is giving away a fat quarter bundle from the new Andalucia fabric line as well as the adorable pendant you see in the photo. For more info on the giveaway and a chance to win please visit her blog . But....if you are the lucky winner you must promise to share that fabric love with me *wink*! Thanks for visiting our blog! Best of luck to you in our drawing! thanks for posting...heading over there now. thanks for the info, heading to check it out now. Thanks for the info! I am going to enter, thanks again!